Veteran horror movie director, producer, screenwriter and actor Wes Craven has died at the age of 76 on August 30, 2015 from brain cancer. Best known for his Scream, The Hills Have Eyes, and Nightmare on Elm Street movie series, Craven specialized in horror movies. "Stop goofing around with cameras in student-film class. I want you to either get your Ph.D. or you’re fired." 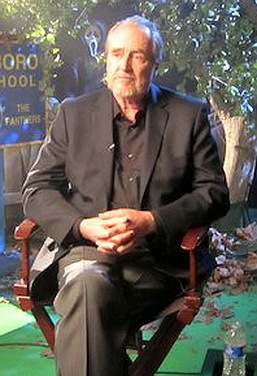 It was likely a surprise to his family and peers in academia, when Wes Craven decided to become a full-time pornographic film director, writer and editor (using pseudonyms) instead. He turned to mainstream movie-making in 1971, producing Together starring then-unknown Marilyn Chambers (model for the Ivory Snow soap box and future star of Behind the Green Door) and directed by Sean S. Cunningham. Wes Craven and Cunningham then partnered to respectively direct and produce an original horror movie written by Craven, The Last House on the Left (1972). The Last House on the Left was one of the first movies actor Martin Kove (Cagney & Lacey) appeared in. Sean S. Cunningham and Wes Craven would partner on many other projects in subsequent years. "There's always the fond hope that someday I'll get to do something else, but I've come to terms with the fact that I'm very good at making genre pictures, and I can express basically anything in them anyway." In his 50+ years Wes Craven began to pop up in front of the camera in small or cameo roles in his own and other director's movies. In Scream (1996) Wes Craven played Fred, the school janitor. Clip below from Scream (1996), arguably Wes Craven's best known film franchise. In his sixties, Wes Craven wrote a novel - The Fountain Society (2000) - and helmed a few popular movies in other genres. He directed Meryl Streep and Richard Dreyfus in Music of the Heart (1999), and Streep received an Academy Award nomination for Best Actress. As a senior citizen, Wes Craven directed the 2005 straight thriller Red Eye starring Cillian Murphy and Rachel McAdams. In 2013 Wes Craven wrote an article Retirement: Scarier than Freddy Krueger published in the Sunday Review section of The New York Times. In it, Craven wrote about the temptation of retirement for himself and wife Iya, and how a series of incidents starting with a fall from his Vespa during a summer of "trial retirement" resulted in stitches in his left leg, knee replacement surgery, and a cracked pelvis over the next many months. He summed it up by saying he was "Back on my own feet and ready to stop relaxing. It’s too dangerous." Wes Craven continued to direct, produce, write and appear in movies as a septuagenarian senior citizen; his most recent film involvement was at age 76, executive producing the 2015 MTV series Scream, based on his Scream movie franchise. Craven created a comic book series Coming of Rage (2014) with writer Steve Niles. Married 3 times, Craven leaves behind two children - Jonathan Craven (b.1965) and Jessica Craven (b. 1968) from his first marriage to Bonnie Broecker - and a widow, third wife Iya Labunka, a movie producer.